Church wedding flowers are the perfect backdrop for your wedding ceremony. Don't feel limited on using this tutorial as a church decoration. The same basic steps are used to create a tall centerpiece for your reception tables as well. However, remember to add in a few more stems, as you would want an "all around" flower arrangement rather than a three sided view that is used in front of a church. Here is a basic step by step tutorial that you can easily modify to fit your own desired flowers and color palette. Before you decide on a design, it's a good idea to visit you church (or other ceremony venue) to take photos and a pad of paper. Stand back from the altar and get a visual on where you need to place flowers. There is generally a lot of open space, so you need to make notes on where your attendants will stand and how to place flowers as a backdrop to frame in your wedding ceremony. There will be lots of pictures, so it's better to cluster the tall arrangements around your wedding group rather than try and space them out which will end up with no flowers in your ceremony pictures! You also need to sit in different spots to be sure your large church wedding flowers won't block someone's view of your vows. I generally recommend that you consider going with large headed flowers that are in the lower price range. Small flowers like freesia, miniature callas, lily of the valley and tulips cost more - but will get easily swallowed up by the vast amount of space. Consider using church wedding flowers such as carnations, snapdragons, larkspur, delphinium, sunflowers and roses. The longer stems and larger flower heads usually will make more of an impact than flower arrangements that are smaller and compact. 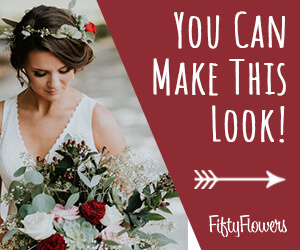 Keep your small, expensive flowers for your bridal bouquets, corsages and boutonnieres - these are going to be in almost all the photos and make a better impression at that point for the money spent. Let's move on and get designing!